Miss Czech Republic Tereza Fajksová is Miss Earth 2012. She bested 79 lovely ladies from different parts of the globe in the 12th edition of the Miss Earth pageant to get the night's most coveted crown and be hailed as an ambassador to environmental protection campaigns worldwide. 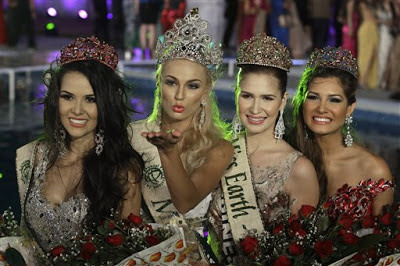 Miss Earth 2011 Olga Alava of Ecuador crowned her successor. The pageant is a glittering outdoor ceremony held at the Versailles Palace in Alabang, Muntinlupa City on November 24, 2012. Miss Philippines Stephany Stefanowitz was crowned Miss Earth-Air (1st runner-up). Miss Venezuela Osmariel Villalobos clinched the Miss Earth-Water title (2nd runner-up), while Miss Brazil Camila Brant bagged the Miss Earth-Fire crown (3rd runner-up). The winners were decided by the panel of judges composed of Harry Morris, Lawrence Peña, Allen Roxas, Mayenne Carmona, Bobby Ray Parks, Joseph Foltz, Eddy Tan, Nancy Yeoh and Palawan Mayor Edward Hagedorn, who served as chairman of the board. Hosted by Marc Nelson and former Miss Earth beauties Sandra Seifert and Ginger Conejero, the Miss Earth 2012 pageant was broadcast live on Starworld and was aired on ABS-CBN Sunday, November 25 at 10:00 a.m.